1961 saw just one issue of The Fantastic Four produced, with the very first issue (cover-dated November) reaching stores in the first week of August. Before sales figures and positive feedback led to the creation of the title as a monthly venture, it would be five whole months before Issue #2 was to follow. Production details around the issue are scarce, with even the inker (believed to be George Klein) unconfirmed. Part of the reason for this is that accurate records were not kept, leading to much speculation today as to exactly who did what. Even 55 years after the title was launched, debate still rages as to what exactly the work ratio was between credited writer Stan Lee and credited artist Jack Kirby, a debate that is referenced in the summary of later years. Yet another part of the reason why details are so obscure is due to the old adage of "print the myth". Stan Lee was, wherever you stand on the debate of his contribution, a great salesman, and his verbal packaging of The Fantastic Four as the dawn of the great Marvel era is one that perhaps plays loosely with the truth. Not only was there the five month gap between issues after it was launched, but there's also the suggestion that book was written as a "patchwork", placed together from the old monster comics the company had been printing. Especially notable is that the Thing's dialogue is out of character for the first "chapter" of the story ("Fool! Did you not see me in time?") 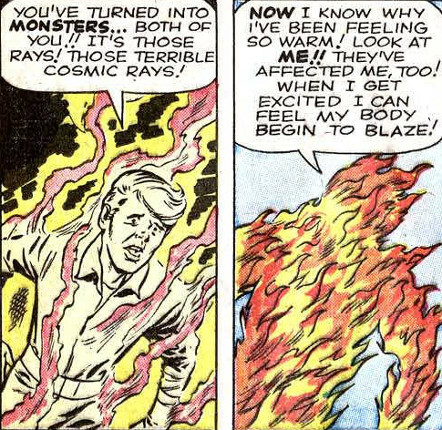 , yet the remainder of the book, particularly the conclusion to the Mole Man tale, sees his familiar contractions and biting sarcasm come into play, suggesting that Stan possibly wrote the dialogue with a long break in between. Stan often took a few issues to capture the "voice" of his characters in his writing... The X-Men's verbose Beast spent the first two issues of his group title talking like a carbon copy of Ben Grimm. Thankfully the familiar rhythms of Ben's speech patterns came through quite quickly. For an extra bit of fun, then the site gives each issue a rating out of five, and it does seem almost churlish to only give the first issue average marks. Yet the debut tale is dated in a bad way, and feel unsure of itself throughout. Long-term readers of this site may recall that a review of the first issue was originally lumped in with the 1962 entry, before it was decided to give it its own page. It's the only representative of the title from 1961, and is broad and unsophisticated, even by the standards of the time. Perhaps the biggest flaw is not the B-movie dialogue that thankfully improved, but the entire notion of Reed taking his fiance and her kid brother with him on board a rocket flight. While the nature of the book is to be... well, fantastical... this is a difficult plot element to accept.